Do you remember the moment when you first learned to blow a bubble? When, after chewing a wad of bubblegum with pure joy and anticipation, you finally succeeded at creating a tacky sphere with the air from your mouth? Well, take that moment, multiply it by a million, and you have a nighttime star blowing a bubble in outer space. This Sunday marks the 26th birthday of the Hubble Space Telescope. To celebrate this momentous occasion, NASA released a breathtaking image of – you guessed it – a bubble being unleashed by a massive star (one that’s about 4 million years old and is 45 times bigger than the Sun). Professionally speaking, this phenomenon is actually called a Bubble Nebula and, according to NASA, it is 7 light-years wide. The Bubble Nebula was first discovered in 1787, by a British astronomer named William Herschel (who also discovered the planet Uranus with a telescope he built himself!). 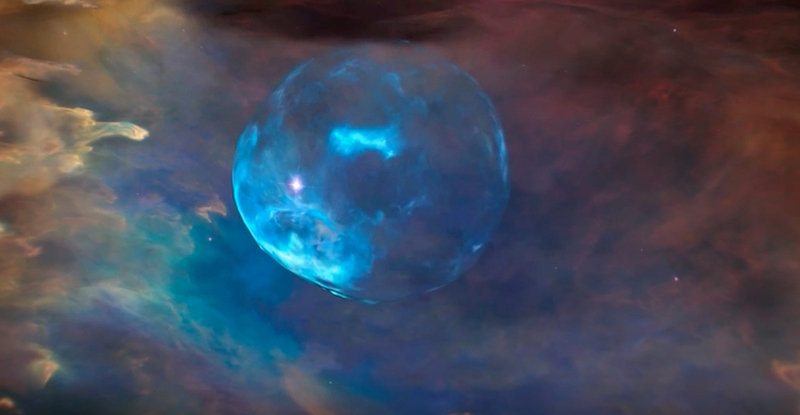 It’s a cloud that forms when the star’s gas gets so hot that it ends up escaping into space as something called “stellar wind.” When this gas current comes upon the cold gas surrounding the star, the outer edge of the Bubble Nebula is formed. Due to varying temperatures, different colors are emitted around the star. The super hot oxygen near the star gives off blue light, while a yellow hue is radiated because of cooler temperatures. These shades can also help scientists identify the different elements that encircle the star. Blue represents oxygen, green denotes hydrogen, and red symbolizes nitrogen.